A screenshot of the city, taken from the game’s site. A little bit of Stardew Valley and Harvest Moon, My Time at Portia is an open world, post-apocalyptic RPG where you manage a construction workshop. 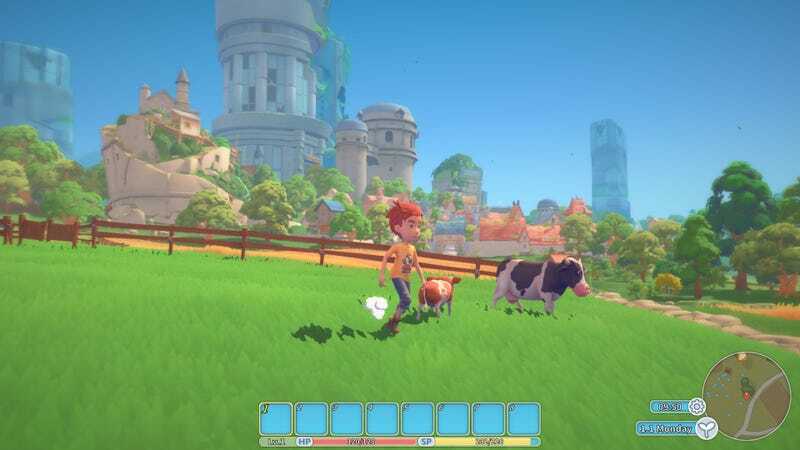 In My Time At Portia, which is available as an alpha on GameJolt, you can build and sell items to townspeople, collect ore, fight monsters, fly around in a jetpack, or just get to know your neighbors. Your ultimate goal is to become the best workshop in town. In order to compete against other shops, you have to fulfill orders from citizens. Doing any of this requires stamina and health management, though I didn’t get to see what happens if you run out of either. Along the way, you’ll find relics of an old world, which the church and the research center argue about throughout the game. Before you can build anything, you have to scavenge around the environment to collect enough raw materials. Once you’re stocked up, you can build smaller items at your crafting table, like tools, or use your assembly station to build bigger items, like bridge parts. Let’s talk about my favorite feature of My Time at Portia. Have you ever played a game where you thought a character was a total jerk, and wanted to maybe punch him in the face but couldn’t? This game lets you actually beat up your neighbors for money. And you’ll want to: while there are missions you can complete to earn money, they often require ore to be smelted into bars. In order to obtain ore, you need to pay a fee of 80 gold to access the first major mining area. This is your workshop and home. When you first arrive, you’ll need to do some repairs. When I got the orders for a bridge, which requires copper ore in order to build it, I panicked. Where am I going to get 80 gold? I thought, bewildered. I tried selling meat and feces I collected from slain monsters (surprisingly, the restaurant will pay more for feces than they will for raw meat) but it still wasn’t enough. If I was going to just sell items I obtained from monsters I slayed, it would take me weeks before I could enter the mines. That’s when I noticed the sparring option above my older male neighbors’ heads. And I was like, “Beat up my neighbors? How could I?” But after slugging and drop kicking Higgins, my main business rival, and he gave me oodles of money, I realized the value in not being a good neighbor. Plus, it somehow improved my reputation with him. Why do you like being beaten up for money, Higgins? After obtaining the money I needed, I went through the mines and scavenged for ore using a shovel. Certain areas are colored differently in the mines: for example, in brownish colored areas, you can usually find copper ore. I had a lot of fun maneuvering my way through the mines using the jetpack and digging holes in the walls to access more parts of the cavern. While I’m not looking forward to forking over hefty fees just to access mines, I am excited to keep building things! Specifically, this nifty little cruiser down below. I’m sure this will come in handy when I venture into new lands! You can also get the demo on Steam, available here.